Cira's Lyrics: Wordless Wednesday - Soooo good! Wordless Wednesday - Soooo good! Oh I have some words this time around all right. Let me set the scene for you. Dinner in the living room instead of the dining room with Daddy, all the boys catching Mythbusters (which they love)! I made marinated pork chops, baked potatoes, rice with veggies. After issues with the twins not eating last night and again getting sick, I was AMAZED at how excited the Bunny Bee was to eat. Mmmm Mommy! How did you make the pork chops? It's sooooo good! I really love it! That alone made me suspicious... but then I was pretty thrilled with myself for making something he was really liking. I could tell the twins were in cahoots about something but was not sure just what. Too much whispering. I thought I heard something hit the floor. When I asked them they insisted nothing did. After he was mostly done eating, the Bunny Bee proudly showed me his plate. I? Told him what a great job he did. 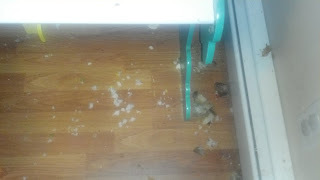 The Doodle Bop angrily threw his full plate of food in the trash after Al went out the door to work, making a comment about how the Bunny Bee didn't eat. The Bunny Bee angrily defended himself and I got mad at the Doodle Bop. I put the boys in a quick shower and as I was shutting the shades in the living room I noticed .... THIS. 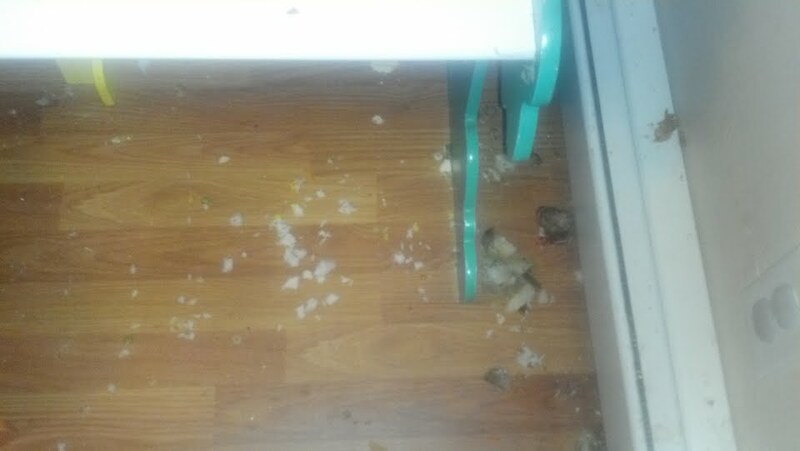 Under the Bunny Bee's seat, nearly an entire plate of food thrown on the floor and baseboard heaters. Dropped piece by piece as he smiled at me and pretended to chew. Uh Oh... someone's in trouble! Isn't it amazing how they never think we'll find out... even thought we ALWAYS do!